So here we are, with a set full of bricks. Many of these pieces are fairly contemporary: new shapes or colours. So – old school values, with new school pieces and colours. These days however we (standard lego consumers) are used to instructions. How will the youth of today manage. Can they just create? How do you inspire it? The set comes with a small manual, offering instructions for 5 different models, all conveniently constructible from the one coloured bag? Perhaps not. I suspect it’s just a big tease. The ‘inspiration book’ invited us to look online for further instructions.Some are simple “No instruction really required: you should be able to build it from the final picture,” through to “This’ll stump you…” Perhaps I should treat it like a problem solving exercise, and use the instructions as answers..? 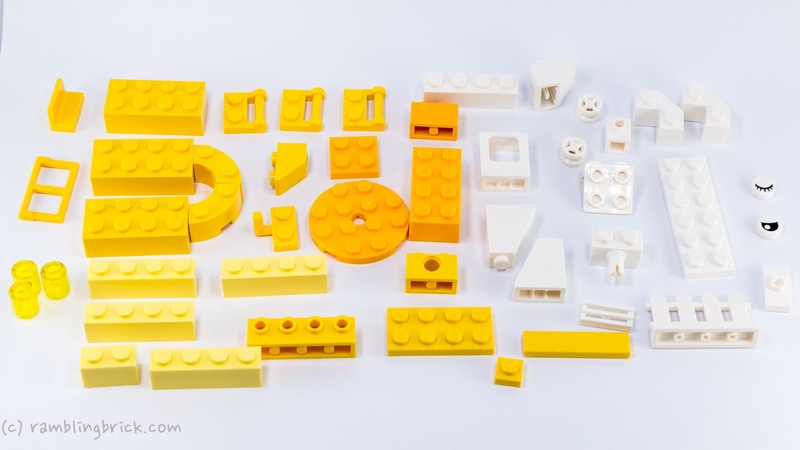 Additional instructions can be found on the LEGO Classic website. One of my favourite aspects of these builds if the variety of scales in use: from a chibi style car ferry to a pair of lilac roller skates. Between the ‘classic purple roller disco skates’ and the boom box, with removable cassette tape included in the instructions/ ideas, there is a nod to days gone past: would children today even recognize these things? Is this just Generation X’s Nostalgia/ Gen Y’s retro taken a step too far. I am a little surprised that an Olivetti Typewriter was not one of the suggested models. Educational applications: 20th Century History Youth Icons. (For those wondering, in the days before the current inline skate, they would have 4 wheels at each corner. Occasionally people would wear them to the roller disco, to dance in skates. The colours and associated fashions could be a little traumatic. But hardly any one suffered significant physical injury. Cassettes were the precursors to MP3’s and Napster. We would occasionally play our vinyl records, and record them onto cassette tapes, to share or play in the car. They could hold up to 45 minutes per side. Track access was sequential, unlike the random access we have today. If you didn’t like a song, you could fast forward through it, or just wait. Often fast forwarding took just as long, as you tried to stop the tape in just the right place. On hot days, left in the car, they would melt! The builds in the ‘ideas’ manual are variable in challenge if attempting to build them without the actual instructions. I built the feeding dog, car ferry, sports car as well as retro fave’s Ghetto Blaster BoomBox and Roller Disco Boots. 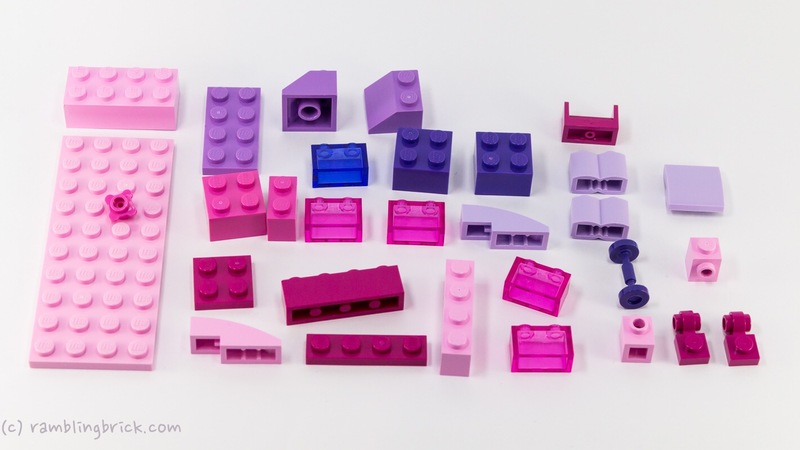 They were all able to be built simultaneously, with lots of left over pieces: I suspect that all the suggested models could be made at once. I think this is a little disappointing: If you couldn’t do this, you would be forced to pull models apart before proceeding with the next! Decisions decisions: Do I go with the Brick Built Beauty, or something my Chihuahua can drive? There are 41 colours, as previously discussed. I will not attempt to name them all, but perhaps some colours are served better than others. There is great variety in (classic old school) green, yet transparent black exists only as 2 1×2 tiles. Trans red exists only as studs (1×1 round plate). Dark red is there, but only as four 1×4 plates. I had to adjust my light and refocus my eyes in order to detect it next to the reddish brown. Here they are, in all their glory…if nothing else, it’s pretty representative of virtually every colour produced by Lego in 2016. Have you picked the missing ones? There are around 10… Leave a note in the comments. 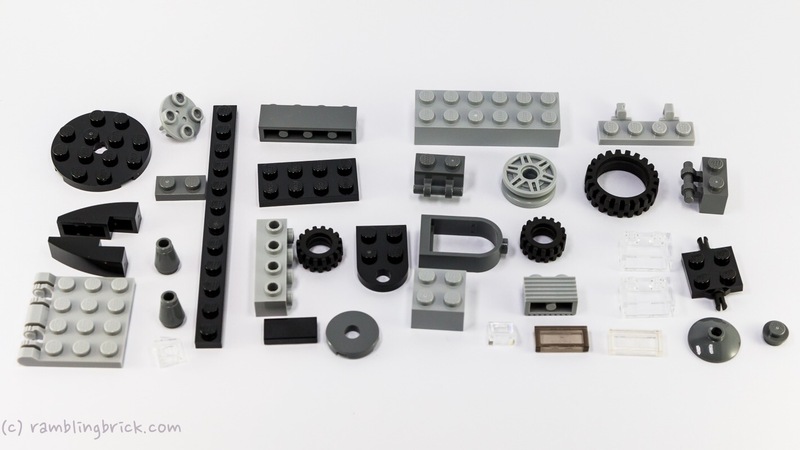 So… Does this set live up to the hope that’its just like an old Lego set’? In part. By expanding the colour palette so much, most colours are not in enough useful pieces to allow solid colour blocking. 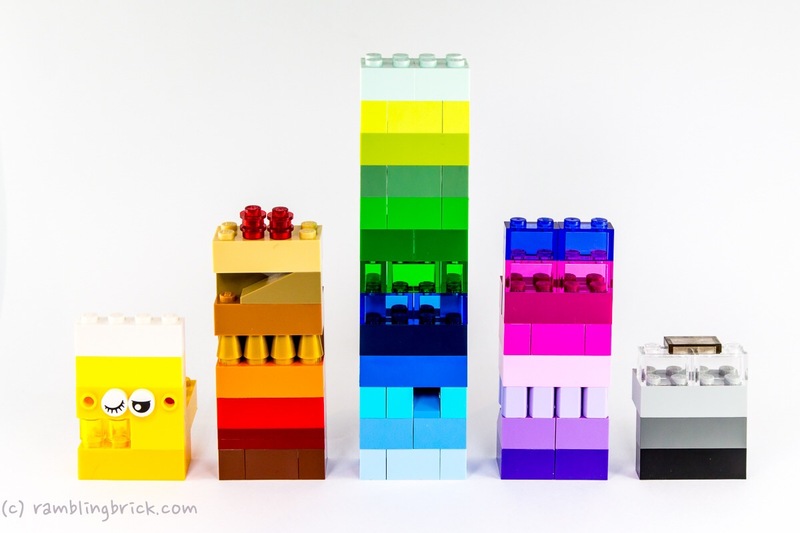 You can make almost anything you wish, BUT you need to be as creative with your colour use as with your blocks. This is not a ‘here is a lot grey to build a castle with’ kind of a set. It plays on the nostalgia that AFOLs/ generation X and our parents have for the old kind of ‘non prescriptive set’. We would appear to be a significant part of the target market, given that children today may not recognize the ‘artifacts’ featured in the ideas book. It is perhaps not as bad as I am painting however. The seated dog model is terrific, with so much character added by the use of the eyes, as is the lilac car. The dog particularly reminds us that a creature can be static, and doesn’t need articulated legs and neck like so many of the recent dragons and ‘build an animal’ creator sets. So would this be a set I would own in isolation? Possibly not. Perhaps two, or in conjunction with a supplementary pack. By not having a balanced palette, we are forced to build creatively. Perhaps this is the point. I like most of the colour selections as well as the variety of pieces. The spread of pieces is good for general free building. The lack of Minifigures frees up the brain magnificently. 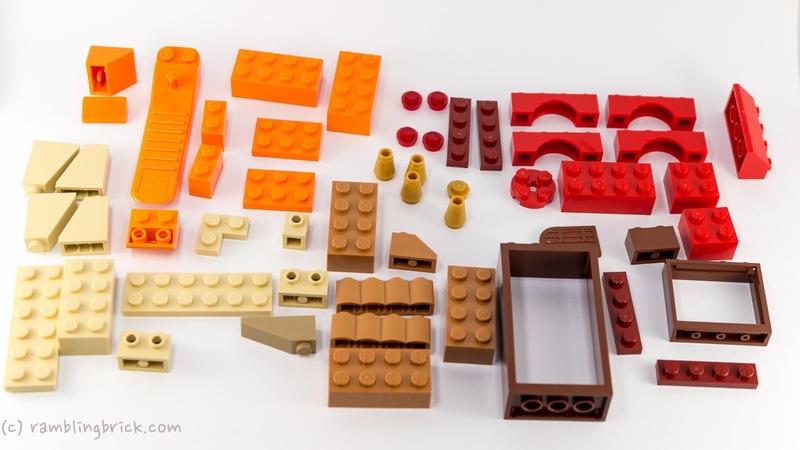 You can build anything with this set, and the ‘Ideas book included’ proves it. You may not be able to build it in the scale you wish, but you will be able to put it together somehow! I’m not fond of the idea that some colours only exist as very small pieces, as if to merely make up numbers. Like the Butterscotch Crunch that tastes almost identical to the Hokey Pokey ice-cream, that was put on the shelves to ensure that 41 flavours were available. The ideas are more like an instruction book. If you are seeking to build within a theme, you are likely to need other bricks. I’ll give this set 4 arbitrary praise units. 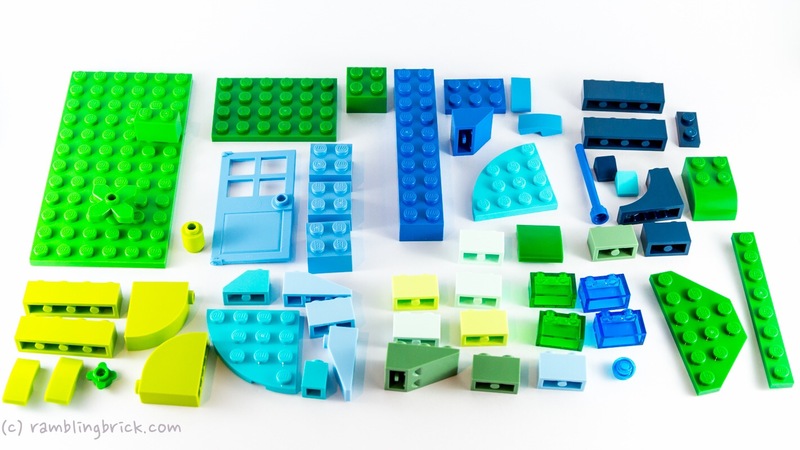 It takes me back to what lego was, as a kids toy, rather than a sophisticated system of interlocking building bricks.